Have you ever heard a friend confess to you, “He´s not my type but I`m attracted to him”? My friends had certainly heard me say this line a few times. I`m a kind of person who didn´t get attracted to someone until I got to know him more. This is probably why I always had fallen in love with men who weren´t my type. My first love wasn´t my type. The next guy whom I had a relationship with wasn´t my type. And the guy I married was also not my type! Why he´s not my type but I`m attracted to him? 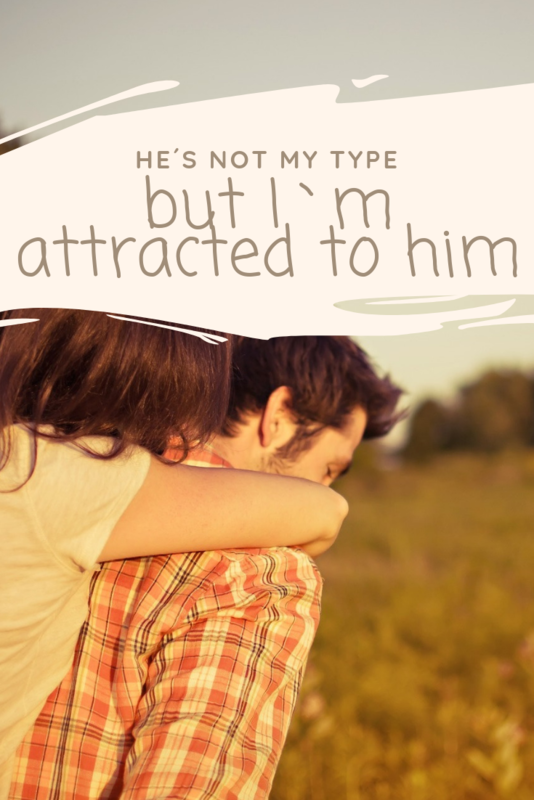 He wasn´t my type because I wasn´t attracted to him physically. He wasn´t my type because he wasn´t fluent in English. What are “Types” and what do they mean to your dating life? Major mistakes that women make when compiling their list to identify their “type” of men. 1. Focusing on what a person has or does instead of who the person is. 2. Your list is based on the pain that you encountered from your past relationships. 3. The items on your list reflect what you don´t want, or what you fear, rather than what you do want. 4. You confused “what” a person has or does with “who” they are as a person and the content of their character. Common misconceptions that women make when compiling their “type” list. a. That a high-paying job equates financial security. b. That a college degree equates intelligence and success. c. That youth means lots of energy. Why it´s okay to date a guy even if he´s not your type? 1. You think he´s not your type but he probably is actually your type. 2. Your true type is probably the one whom you have never dated or considered as a realistic option. 3. The qualities that your non-type has are probably what you need to sustain a long-lasting relationship. 4. You probably doesn´t really know what you are actually looking for. The three love stories below were the standouts in my life. But in between, there were other tiny love stories which involved different other men who caught my attention (if not my love) even when I thought they were “not my type” at the start. I met my first love in university. He was my classmate for four years — the entire uni time. At first I never thought he was anything special. He was not tall. He was not more intelligent than I was. I was bossy and he was more of a follower. Certainly he´s not my type. But then for some reasons we became friends. And then we became really close friends. He was a gentleman. He cared for me and he always looked after me. He taught me how to be a girl and how to let a man take care of me. He did everything he could to make me happy. Then one day I realized I had already fallen in love with him. How did I fall in love with someone who was only a few inches taller than I am and who looked shorter than me whenever I wore heels? And I loved (still love) wearing high stiletto heels! I met my second love at work while I was living and working abroad. He was my colleague. At first I never thought I would ever like him, much more have a relationship with him. Although he was tall and handsome, he had a high waist, wide and full buttocks, and thick legs. Not the type of physique that I would fancy. And then he was a snob. We´d been colleagues for over a year but we never said “hi” or “hello” to each other. We literally would just ignore each other even if there were only the two of us in a room. Many women at work had a crush on him, including my close colleague. I was probably the only asian female who wasn´t impressed of him. Certainly he´s not my type. But then cupid has a funny way. We were both sent to a school camp where we became friends and ended up hanging out together. We were also often sent to seminars and workshops to represent our school, just the two of us. He found himself liking me, so he pursued me. I discovered that beneath the snob facade, he´s actually a nice person with a good sense of humor. And he´s very intelligent. Intelligence was for me extremely attractive. Then one day I realized I had fallen in love with him. How did I fall in love with someone whom I never even thought I could be friends with? I met my true love online during a random profile search on a social networking site. He´s physically very attractive — tall, dark and handsome. He had the figure of Superman. Broad shoulders, well-built muscles, very good proportion, and strong, muscled legs like that of a horse. But he could hardly speak English. His sentences were littered with grammatical errors and he had difficulty conveying his thoughts in the language. In my head I quickly concluded that he´s not my type. Because he wasn´t fluent in English I mistakenly assumed that he wasn´t intelligent. Thankfully he convinced me to give him a chance. He quickly learned to speak and write in English. Our communication gap was closed. I discovered how wonderful a person he was. As it turned out, he´s the kind of man I needed for a husband. So I literally found myself saying, “He´s not my type but I`m attracted to him” more than a few times. “Types” are the things you have in your list which you use to filter potential partners. If a man tick the boxes in your list, you´re willing to go out with him. If he didn´t tick most boxes, you´re not interested to go out with him. Does your list focus on finding out who the person is or does it focus on what the person has or does? Is your list not based from the pain you encountered in the past? Does your list reflect what you do want in a partner instead of what you don´t want or what you fear? Does your list reflect your clear understanding of different “attributes”? Does your list give you a bigger dating pool or does it narrow to a tiny little pond? Oftentimes the list of criteria that we create to filter potential partners is one of our biggest dating blocks. Instead of leading us to the perfect partner, they cause us to miss out on potential perfect partner. So how do you evaluate your list (which describes your type of men) to make sure that it doesn´t hamper your search? We all make mistakes when it comes to identifying who´s our type and who´s not. We all are guilty of compiling a list that does not serve us best, at least this is true at some point in our lives. I saw a clip of Steve Harvey´s show where a woman asked Steve for help on finding a potential partner for her younger sister. Both sisters were attractive — tall, slim and well-dressed. Someone from the audience, a mom, pointed to her son who was sitted beside her. Her son was single and available. So Steve interviewed the mom. She excitedly announced that her son is an accomplished professional. He has a high-paying job and he owns two houses. Suddenly, all the single women in the audience got interested. Oh, wow! The poor guy was put on the spot, suddenly became the center of attention of most women because of what he has. But how about who he is as a person? have a high paying job. be a CEO of a Fortune 500 company. This type of criteria is superficial because it focuses on what a person has or does instead of who he is. No matter how painful is your past, it is never a bad thing only if you focus on what you learned from it. You would want to use that lesson to make your next relationship a success. However, using your pain from your past relationship as a criteria in searching for your potential life partner can be detrimental to your success. You may become fixated on finding a partner who is outgoing in order to compensate for a dissatisfying relationship with someone who was shy and not social. Or you may be putting extreme emphasis on finding someone loyal because you have been cheated in the past. Or you may be seeking someone who is adventurous because your previous partner lacked spontaneity. If you build your list based on the pain of your past, and you put emphasis on it, you can missed out on getting to know a person for who he really is because you´re busy unearthing if you could tick the boxes in your list or not. If your list is built on all the things that you don´t want or that you fear, your list is built on negativity. Instead, create a list that focuses on what you actually want in a person. You may be motivated to create a list based on fear as a rebound from a failed relationship or from a certain kind of person. But remember, just because a relationship failed does not mean that you need to over correct by looking for opposite qualities on future potential mates. I remember the first time my husband visited me in Bangkok. I was working as a foreign Maths teacher in an Indian international school in the city. My then-boyfriend was living and working in Germany. It was our first ever meet-up after getting to know each other online for six months. He had a two-week summer vacation from work so he grabbed the opportunity to see me in person. It was his first time to visit Thailand. When my boss heard that my boyfriend from Germany came to visit, she wanted to meet him. So I took my boyfriend to the director´s office to introduce him to her. What I didn´t expect was the interrogation that followed. My boss asked my boyfriend point-black how much he´s earning. Neither I nor my boyfriend anticipated such a question to come from her. She asked what my boyfriend does and what he´s monthly salary was. When my boss realized that she wasn´t going to get any figures, she said that she simply did not want to let any man take me out from her school unless she´s certain that I would be in good hands. My boss had the biggest misconception. That if my boyfriend had a high-paying job I would be in good hands. You may want to meet someone who has a high-paying job because you desire financial security. But just because somebody has a high income does not mean they are financially responsible or secure. They could make more money than most but still live paycheck to paycheck. You may be looking for someone with a college degree because you want someone who is intelligent and successful. The error is in thinking that a college degree will ensure intellect and a good career, while the lack of a degree meant someone is unintelligent and unsuccessful. You may want to meet someone considerably younger because you want to be with someone who is active and has lots of energy. But that´s not always the case. A healthy lifestyle and a positive outlook in life play a bigger role on a person´s energy level than his age. As you can see from my own love stories, all the guys that I had dated were initially not my type. But those men played important, albeit different, roles in my life. They´d taught me many things, and they´d helped me learn more about myself. Truth be told, dating the guys who were not my type were the best thing that I ever did in my dating life. So why is it okay to date men who were not your type and why is it okay to say to yourself or to your friends, “he´s not my type but I`m attracted to him”? The first time you think he´s not your type, chances are you´re using your superficial filters. You judge him based from what you see from the outside, or based from what he does or has. But what you don´t know is that he may have all the qualities that you like in a person. Traits and qualities that are important to you. How would you know if he is the one if you haven´t given him the chance in the first place? If you´re still single now, it´s probably because you´re holding on to a specific type of guy. When you create an outline for what type you want, you set yourself for someone you haven´t even met — someone who does not exist. When I was younger I had a very strict list of what my “type” of man was. Whenever a guy would show his interest on me, I would quickly go through my list. Most of the time the boxes in my list weren´t ticked. No wonder I was forever single until I was twenty-five years old. I found this to be very true in my life. The man I married was someone I initially dismissed as my non-type because of his lack of fluency in English. While my ex wrote impressive English poetry for me, my new guy couldn´t construct grammatically correct paragraphs. But he was more than his fluency in the English language. He has the qualities that I was looking for in a perfect partner. He has what I needed to sustain a long-lasting relationship. It´s been ten years since we met in person, and eight since we said “I do”, and we´re still as in love as ever. We´re still as attracted to each other as ever. And we´re still as happy as ever. Until he is in front of you, and until you get to know him better, you really does not know what you need in a happy and successful relationship. Think about how many men you may have dismissed as a non-potential mate because you thought, “he´s not my type”. Think about how much bigger your dating pool would be if you considered going out to a date with someone who wasn´t your type. What if the guy who will make the perfect partner for you is someone you´re currently considering as your non-type? Be more open to meeting more people and be inclusive in choosing whom to date with. You´ll never know, you may find yourself saying to your friends, “he´s not my type but I`m attracted to him”!